The Col Agnel pass is in the Cottian Alps (southwestern Alps that are part of the border between the Hautes-Alps and Savoie of France and Piedmont of Italy). The Agnel's peak is on the French/Italian border (see map at bottom of page). The Col Agnel is one of France's three highest mountain passes. In France only the Cime de la Bonnette and the Col d'Iseran are higher. The Col Agnel is little used in the Tour de France, the first ascension coming in stage 15 of the 2008 Tour. It was revisited in 2011. Both times it was rated an Hors Category climb. It was scheduled to be part of stage 19 of the 1995 Giro, but an avalanche caused the ascent to be cancelled. 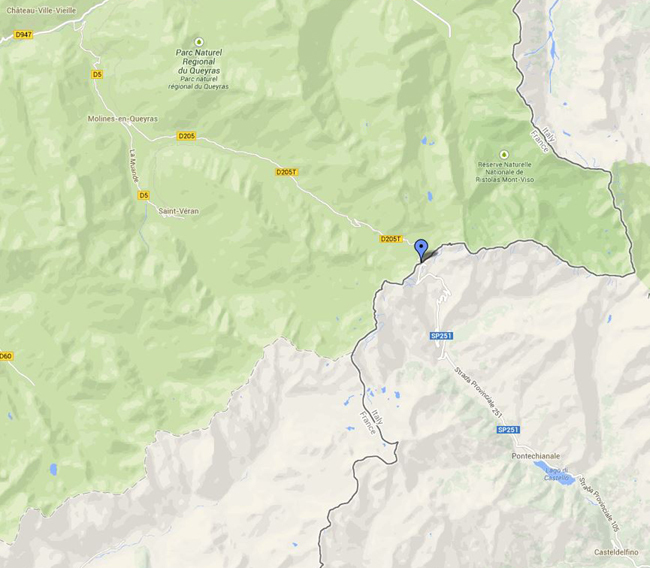 The blue dot on the France/Italy border is the Col Agnel's crest. In the upper right hand corner is Château-Ville-Vieille, across the river from Château-Queyras where the French side of the ascent begins. Casteldelfino where the Italian side of the climb starts is in the lower right corner.